We're happy to be hosting our first holiday décor class on December 12th at picturesque Great Oak Manor. Join us for a 2-hour class in the spacious Sun Room overlooking the Chesapeake Bay. Students will learn the basic of designing and embellishing a long-lasting garland or wreath. Choose between evergreens, magnolia, mossy branches and more for a custom complement to your home. Browse our selection of ribbons and festive accents to add to your creation. Learn new techniques and get help with questions for installation and styling your home for the holidays. Hot cider, wine tastings and refreshments provided by Great Oak Manor. Please call Great Oak Manor directly to register for class. 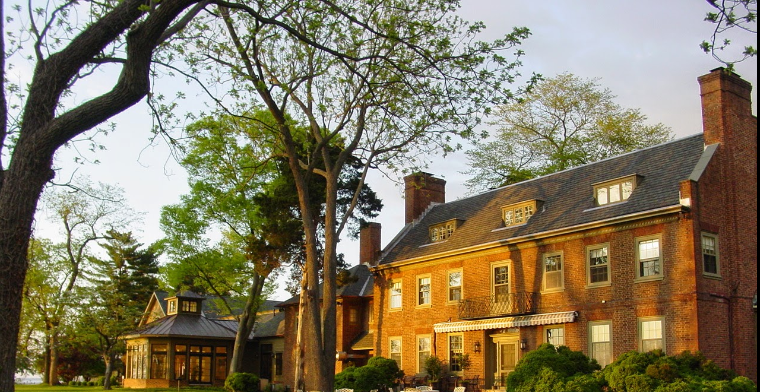 Ask about how you can receive 20% off the cost of class or a stay at the Great Oak Manor B&B. In this open level class, students will work with seasonal and locally grown product. Magnolia, evergreen, unique cut branches and winter berries will constitute a majority of the décor to build a lush winter masterpiece. Students have the choice between making one 30-inch wreath or one 3-foot tabletop garland. All materials provided, includes but is not limited to: satin ribbons, pine cones, oranges, lemons, pomegranates, rose hips, bittersweet, star anise, cinnamon sticks, moss, and so much more goodness! Learn professional bow making tips! Emphasis will be placed on color blending techniques and using a variety of textures and natural elements to create a long-lasting floral masterpiece. Participants will leave with knowledge of basic floral preparation practices, the concepts of layering and form, and handy tips on how to gather the necessary materials on their own down the road. Limited to 25 students. Clippers and other tools provided.